The primary specification associated with a digital camera in how many megapixels it has. A megapixel is about one million pixels, which are the individual little dots that the camera records the color and brightness of to create the data in the image file. Unless you crave a pointillist look, the more megapixels the better. Two megapixels is a practical minimum for taking slides to submit for judging at serious competitions. More than six or eight megapixels is not visible unless you plan to make enormous prints fr om the images or if you will be enlarging small parts of the picture to something like 5x7 inches. When would you do that? Think of photographing animals in the wild, or boats on the water. It is often impossible to get close enough for the unedited image to be effective. Your camera might also let you adjust the number of pixels it actually uses and records. Using fewer lets you store more photos in the camera's memory. When taking photos of your artwork, this is not likely to be a limitation so use the greatest number of pixels you can. This adjustment might be labeled "image size" or something other than "pixels", so refer to your camera's manual. Cameras can also store the image data in a compressed form. For instance, if half the photo is sky and all the same color, there is no need to separately record "light blue dot" one million times. Software in the camera will condense the size of the image data files so you can fit more photos in the camera's memory, but at the cost of losing some of the very fine details. Set the camera to do the least amount of file compression possible; this will give the least loss of detail and the best images in the final slides. Start by hanging the painting to be photographed on a wall or easel that is not in direct sunlight and that does not face directly into a window. Sunlight directly on the painting can cast a shadow from the frame or a thick mat or cause glare on the glass or paint. Additional lighting is usually needed for a good picture. Use white lighting when taking the photo. Because the best choice is sunlight indirectly reflected onto the painting from a white wall or a large white cloth or paper spread on the floor wh ere the sunlight falls, open all available doors and curtains to admit as much diffuse light as possible. Be aware of light reflecting from strongly colored objects. The painting will pick up that color, which may in turn affect the color of the image in the final photo or slide. If photographing a painting that is under glass or has a shiny surface like some oils, think of it like a mirror that will reflect light from any objects in front of it. Do not use a flash mounted in or on the camera because it will reflect in the painting's glass. Turn off the camera's automatic flash. If your camera's exposure meter says that more light is needed than is available, provide additional lighting from both sides of the painting at about a 45 degree angle and with about equal intensity. 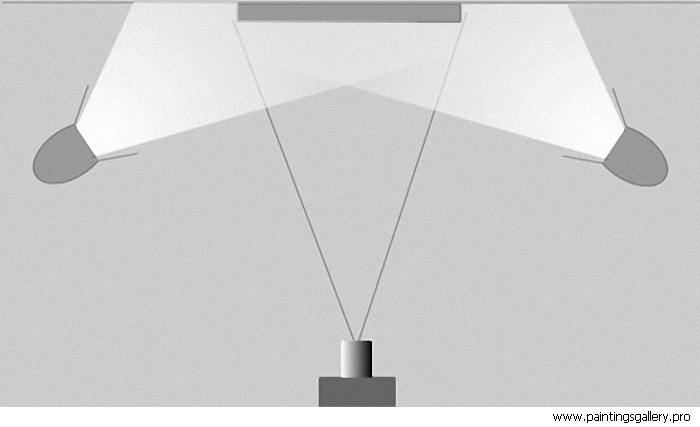 Lighting from only one side will leave asymmetrical shadows from the frame or from spacers and multiple mats. A third light sitting on the floor in front of the camera can also be used. For occasional photographers, color balanced lights such as from Ott are good, followed by halogen lights. Avoid incandescent bulbs because they add a strong yellow cast. The darker a painting is, the more likely it is that incidental light reflected in the glass will interfere with the image. Stronger lighting directed onto the painting from the sides can often overpower a mild reflection. To minimize stray reflections, dim any lights shining on the camera and hang an unpatterned dark cloth on the wall behind the camera. The lack of a contrasty pattern is more important than the color or even how dark the color is. If necessary, hang a dark cloth on the tripod to cover light colored legs or knobs on it. Before taking the pictures, look from the camera position for any reflections visible in the glass of the painting and hide their source. Also consider the clothes you are wearing. If you stand behind the camera, a white shirt will be quite evident. Either wear mid-tone or dark clothes or, better, step to the side while using a cable release or self-timer to take the photo. Bare arms do not seem to create a problem with reflection but verify this visually. Because film is less sensitive than the human eye, faint reflections are not generally a problem. If you have one, a polarizing filter on the camera lens can also eliminate a large amount of reflection from glass or from an oil painting. With it mounted on the lens, rotate the filter while looking through the viewfinder. At some position, the reflections will be minimized or eliminated. Leave the filter in this position while taking the photos, but you will have to check it again if you reposition the lighting, camera, or painting. Use a tripod (either a full size one or a tabletop version sitting on something), or sit the camera on something solid. Be sure the tripod legs are fully spread. Turn the tripod's camera mount to a horizontal or vertical position to match the painting. Position the tripod so the camera is directly in front of the center of the painting, both horizontally and vertically, to eliminate foreshortening of one edge. Look through the viewfinder to confirm this. In the proper position all four edges of the painting are parallel to the viewfinder's edges. Move the camera towards the painting, keeping the painting centered in the viewfinder, until the painting's frame just disappears at the top/bottom or at the sides. Alternatively, with a zoom lens the tripod can be kept stationary while the zoom is adjusted so the picture fills the frame. Generally you will not be able to exactly fit the painting into the photograph, so get either the width or height to fill the frame; the other dimension will contain extraneous content that can be removed later. No camera has the ability of the human eye to capture subtle differences in dark and light colors simultaneously in the same scene. This means that in a photograph of a high contrast painting either the dark or the light areas will lose some detail; however, you can choose which of the two is retained by the way you take the picture. There are two ways to do this. Most modern cameras have automatic exposure modes and those generally work well for photographing paintings without extremes of value. If you want to be sure to capture subtle details in the dark areas of a painting with a lot of contrast, take some extra photos with the exposure adjusted a quarter or half stop more open to let more light in and therefore to enhance the dark areas. If you want to prevent details in the light areas from being washed out, close the exposure adjustment the same amount. The second approach is to use the camera's exposure lock if it has one. In this method, the camera is pointed so the area of greatest interest is centered in the viewfinder. It may be necessary to zoom in so that area fills a large portion of the viewfinder (a quarter or more of both the vertical and horizontal dimensions). Pressing the exposure lock button will set the optimal exposure for that area. The camera is then adjusted to recenter the picture, and the picture is taken using the locked-in exposure for the area of interest. This process will have to be repeated for the next photo since the exposure lock will release itself. Doing either of these will make the entire photo slightly lighter or darker, enough to enhance the selected important details without noticeably affecting the overall impression. Refer to your camera's instructions for how to make these simple adjustments. Avoid camera shake from your finger by using a cable release, which is essentially an extension of the shutter button available for a few dollars at camera stores, or by using the camera's self-timer to take the photo several seconds after you release the shutter. Remove your hand from the camera after activating the self-timer. Make two-three shots of one painting.